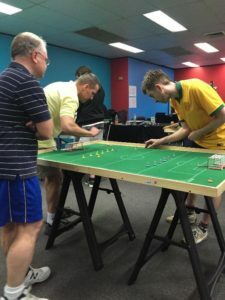 The quarter final pairings made for a couple of straightforward games and a couple of nailbiters. Peter had a comfortable run against Gordy. Adrian made Robert work hard but the result was never in doubt as Robert dominated and took a 2-0 victory. The two Steves fought out a classic as Steve The Younger, whose game has come on incredibly over the course of the year, pushed Steve The Elder to extra time after a 1-1 regulation time result. In the sudden death period, Steve The Younger gave up possession with his travelling ‘keeper midway through. Steve The Elder managed to get the ball into the shooting zone with his 4th flick, but a great defensive flick from Steve The Younger made Steve The Elder’s shot almost impossible. With the most delicately placed flick, however, Steve The Elder found the millimeters wide gap to get just the right angle and see the ball trickle in the inside of the goal to take the victory. The other quarter final was probably the day’s most exciting game, in spite of a distinct lack of goals. Eliot and Raffaele went at each other for 30 minutes without finding the inside of the goal. The posts and crossbar, yes, but not the back of the net. A further 10 minutes was still not enough to split the two as passions rose further, so shots were called. Both players found their shooting form had left completely as, with a full crowd gathered ’round, every shot of the initial 5 each went either wayward or was saved. As the sudden death phase of the shootout began, Eliot finally found the net to take the upper hand. Raffaele, however, was not about to lay down and drew level with an equally well hit shot from wide. Eliot then slotted his second and the pressure was back on Raffaele. This time, a fingertip save from Eliot’s ‘keeper was to deny Raffaele and Eliot finally took the honours and the last place in the semi-finals. The repechage games saw Daniele put 7 past Louis who was strapped into his Go-Pro camera. In the other semi, David needed shots to get past Giuseppe after a goal each in regulation time meant they couldn’t be split. In the repechage final, shots were again needed as the evenly pitted pair of Daniele and David cancelled each other out during the 30 minutes of play. In the shootout, Daniele couldn’t find the goal in 4 shots, while David eased 2 of his first 3 past Daniele to take the consolation title. The main semi-finals were pretty much a non-event for Eliot. Having flown in from Samoa on the morning of the competiton and peaking with two showcase performances in the group stage and a tense, hard-fought victory in the quarters, his body went into Samoa time and Robert walked all over him. A clinical display saw him slot 4 unanswered goals past Eliot to breeze into the final. On the other table, things were getting heated as Peter faced Steve. Raffaele had his hands full refereeing and making judgement calls on the fast paced movements and subtle rule inflections. 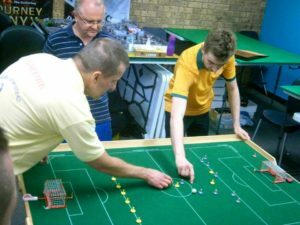 A goal in each half, however, saw Peter make his way to set up a game between the two players the draw always try to have play out a final – the top two seeds. After some initial deliberation as to which pitch would be used for the final, Peter and Robert finally got to their showdown. Excellent skills were demonstrated throughout the game. Peter dominated possession with his pin-point flicking, but Robert’s defensive positioning was exemplary, closing gaps time after time. As Peter grew a little frustrated, the odd mistake crept in to his game, giving Robert a bit of breathing space. However, it was a stale mate by the end of the 30 minutes with neither player being able to grab the game by the scruff of the neck. Extra time began in a similar manner to the rest of the game, Peter having the better of possession, Robert not allowing goal scoring opportunities. Then, midway through, came the game’s crucial moment. With a classic counter-attack sucker punch, Robert finally managed one of his few shots on goal for the game. This rattled the back of the net and Robert took the title, his first on Australian soil in two decades. Also of note was that Robert defeated all three of the other semi-finalists on his way to the title. A huge thanks to all who took part. To the new players, Andrea and Louis, we hope you enjoyed it and got a thirst for more (and thanks for the slo-mo clips, Louis). To those who travelled – Raffaele (and fan club) driving up from Berry, Peter again faithfully taking the highway up from Canberra, Giuseppe flying down from Brisbane, David flying up from Melbourne and Eliot who squeezed us in on the back of a tiring work trip (and little sleep) to Samoa. Your presence was greatly appreciated in making a great tournament. And thanks also to the Games Cube for the use of their premises at exceptionally good rates! 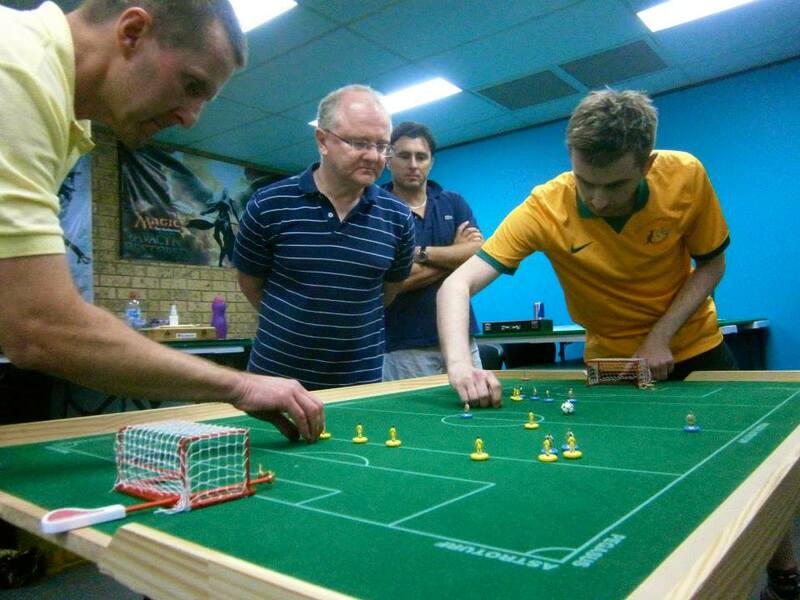 Subbuteo Parramatta was honoured to host you all and looks forward to the continued growth of the game next year. This entry was posted in FISTF News and tagged Australia, Results. Bookmark the permalink.